Among the Shadow Paladins, one common debate is exactly which card is a mirror of which Royal Paladin. Fullbau was a complicated case, being a composite counterpart to Graeme, Wingal and Wingal Brave, but Blaster Javelin is more straightforward. Sharing their designers, as well as grade and overall presence in their respective armies, Blaster Javelin is direct a counterpart to Knight Squire, Alen. The two units have a number of similarities between their armors, and Javelin's helm appears to be an inversion of how Alen's was designed, having a general downward slope that proceeds toward the ground rather than the upward-facing structures above Alen's brow. In addition to their visual similarities, both units represent opening rides of their respective manga users, Suzugamori Ren and Sendou Aichi, and each unit carries a power gain skill. Following through with the narrative that Fullbau began, Blaster Javelin's scene is opened in the middle of a stair, approaching the ascent to where Blaster Dark stands. One of the skyscrapers present in the latter's art can even be seen in the backdrop, adding the foreboding sense of something appearing from behind Javelin. At first the angle disorients the viewer away from this, giving the impression of Javelin being suspended in directionless space, but his shadow gives weight to the image and establishes which direction the stair is leading. Despite Blaster Javelin's right leg being absent from the illustration, we are given the suggestion of its presence by the broad, spade-like form of his weapon. The point terminates where his other foot would rest. Despite being elevated above Fullbau's preceding illustration, which appeared to be well-lit by the midday sun, in Javelin's painting the sky is becoming rapidly clouded and we cannot find the actual light source inside of the frame. Toward our right the light levels change enough that the sun appears to be setting outside of our view, and nighttime can be seen subtly coming up on the left. This creates an interesting situation in which Javelin is situated perfectly between night and day, being a metaphorical "shadow" between them that shows some participation between the art creation and his card lore. Similar to Fullbau, Blaster Javelin's body is drawn low to the ground, in a very masculine pose that reflects him in a more Far Eastern light than as the European influence that paladin cards usually evoke. These low, earthly postures are common in traditional depictions of samurai, where the earth and masculinity had a close association through the Orphean narrative of Izanagi's journey through Yomi. This, combined with the positioning of his armor plates--patterned along the same lines as ou-yoroi but with a short cape integrated to prevent him from being completely dissociated with his knightly counterparts--significantly removes Javelin from how his Royal Paladin opposition, and Alen in particular is traditionally interpreted, as European knights. In terms of body formation, this puts the emphasis on the legs and stomach, creating a triangle where all parts of the body are oriented to the floor. Rather than creating an idealized western physique with a thin waist and prominent shoulders, this highlights old Japanese concepts of masculinity where the warrior canon of proportions features prominent lower body structure, based on the samurai class' physique. For comparison, consider how these three Edo-period woodblock prints line up with Javelin's posture. 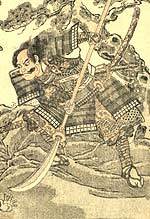 Utagawa Kuniyoshi's eighteenth century depiction of Isoai Juuroemon Masahisa and Tsukioka Yoshitaka's nineteenth century print of Mitsumura Jirouemon both show classic masculine posture, while this Edo-period print is nearly identical in stance. Javelin's expression contributes to the samurai interpretation of him, showcasing a form of expressive restraint characteristic of that same old masculinity that his posture suggests. The javelin weapon he holds is also similar to a naginata, a common weapon among the samurai class. The reason that this point has to be so heavily stressed is that the javelin he's holding wouldn't normally look this way, but Ryuutetsu exploits the angle to give it an artificial curvature, and force that appearance onto the weapon. This reflects Javelin's character, retaining the fealty of Japanese bushi. So in spite of belonging to a terrorist organization like Shadow Paladin, Javelin attempts to maintain his honor, being caught up between his own internal sense of justice (the Shadow Paladins) and the laws of the system he was born into (the Royal Paladins.) This type of lionized self-versus-world narrative is a recurring element of Japanese storytelling, which often gives the spotlight to a samurai's personal beliefs coming into conflict with having to show absolute loyalty to his feudal lord. In Javelin's case, he chooses to forgo the traditional approach of honorable suicide in favor of joining up with the Shadow Paladin's ranks, the setting's equivalent to becoming a masterless ronin. "A spear-wielding knight drowning in darkness, armed with a black Blaster. Although he was originally a Paladin, he found himself questioning the very system of this decadent country, allowing the dragon of hell to turn him into a knight of the shadows. Despite being turned to darkness, there is no replacing the heavy loyalty he holds, as he will faithfully follow those whom he considers his master, no matter what." Main article, sky, posture and stair commentary by Touya. Samurai commentary jointly provided by Wolthera and Touya. Lore translation by NeoArkadia.